A TV show about how TV shows are rubbish – The Nuge. 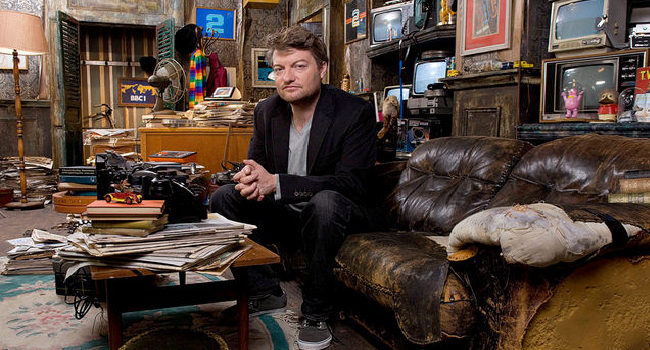 I’ve been enjoying How TV Ruined Your Life, the new show from writer, comedian and miserablist Charlie Brooker. The latest episode was shown last night on BBC 2 and continued in the same vein as its predecessors. As its pessimistic title suggests, every week Brooker casts his weary, misanthropic eye on the legacy of television and its largely negative influence on the world. It’s an excellent and appropriate vehicle for the satirist’s acerbic sense of humour, and a strong debut for Brooker on a terrestrial channel, but it’s not without it’s problems. Perhaps its biggest fault is that it’s too self-consciously bleak. From the title screen onwards, How TV Ruined Your Life aims to look only at everything wrong with the medium. This is in contrast to his first onscreen offering Screenwipe (and its News and Games spin-offs), which took a similarly cynical look at its subjects, and offered similarly wry clips packages with a ranty narration. But those earlier programmes, whilst derisive, were also celebratory. As host, Brooker was obviously as much a fan of good TV as he was the scourge of rubbish TV, and his evangelical praise of quality shows like The Wire and Deadwood was as entertaining and informative as his damning indictments of dross like My Super Sweet 16. This new show is a little more one-track-minded. It treads a familiar path, and the montages are as snappy and well-edited as ever, but the tone is unrelenting. Brooker’s fanbase will be gratified, but he seems to be playing up to his grouchy public persona (a character also seen on the almost-good 10 O’Clock Live). He is scathing in his assessment of television’s ultimate effect on society; the conclusion always reached is that TV’s contributions have given us, as a people, a net loss. It’s a conclusion which is not only ironic given the medium that the message is delivered, but self-evidently untrue, as Brooker himself would probably attest, if put on the spot. But it’s still good. The host is still on form, and though he piles it on a little too much, his brand of exaggerated cynicism and dry wit remains refreshing in a schedule which would otherwise continue to pour glossy smiles and unalloyed optimism on a confusing world. The best of his journalistic writing has made it to his onscreen persona, and he remains the high priest of biting put-downs, e.g. “a show which already looks so insanely dated, it might as well have been presented by George VI”, or “When you first encoutered wi-fi it was like magic. Now you’ll moan like an oppressed dissident if you can’t get a 20mb download speed on your novelty ****ing teaspoon.” Charlie Brooker remains a unique and brilliant figure in broadcasting, and whilst this show is not his best, he remains a shining beacon of comic genius, and miles ahead of any competition – if indeed he has any.